Considering so much of my wardrobe consists of basic tees, simple knits, and classic skinny jeans, I often rely on accessories to complete a look. This outfit is a perfect example of that. I started with a cozy sweater that I actually found in the Men’s section at Urban Outfitters! I wasn’t in the mood for regular blue jeans, so I decided to swap them for some white skinny jeans. 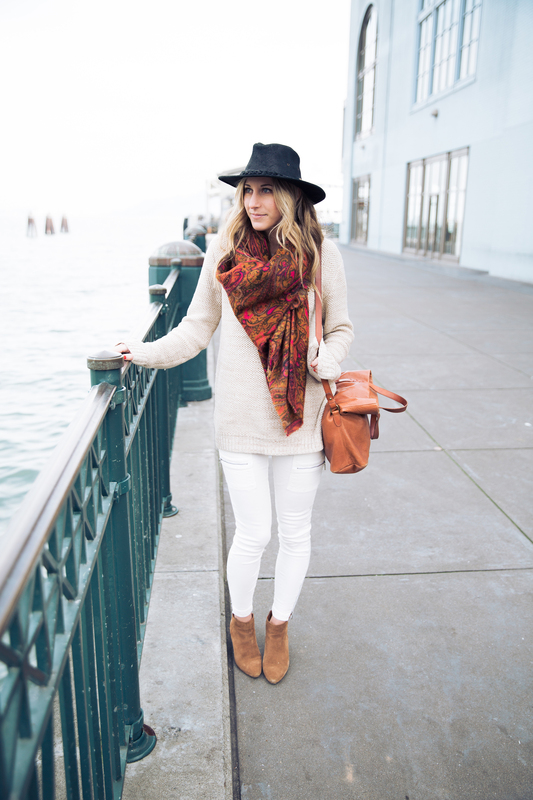 I find that white jeans can totally transform a look and take it to a new level. 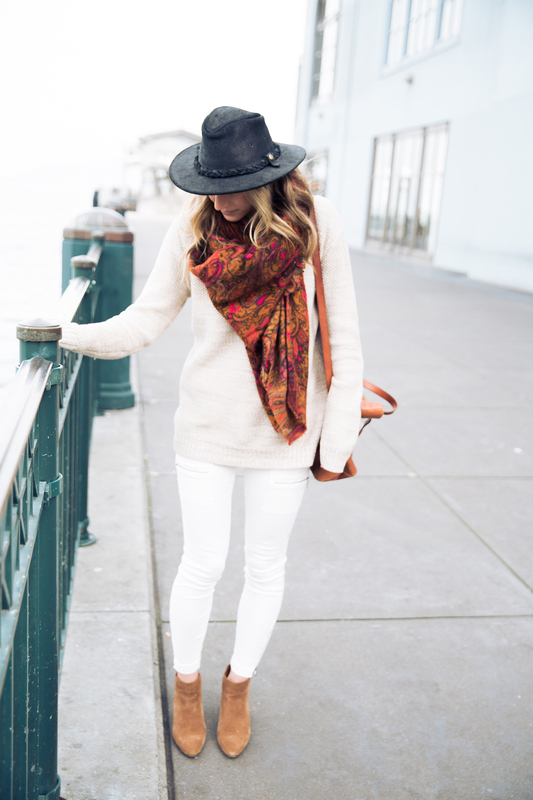 But a neutral sweater and white jeans isn’t much of a complete outfit. This is where my accessories come in. When I say accessories, I mean hats, scarves, jewelry, bags, and even shoes. These additional pieces can seriously make all the difference in your outfit, transforming it from basic to edgy (or even making it seasonally appropriate) in an instant. 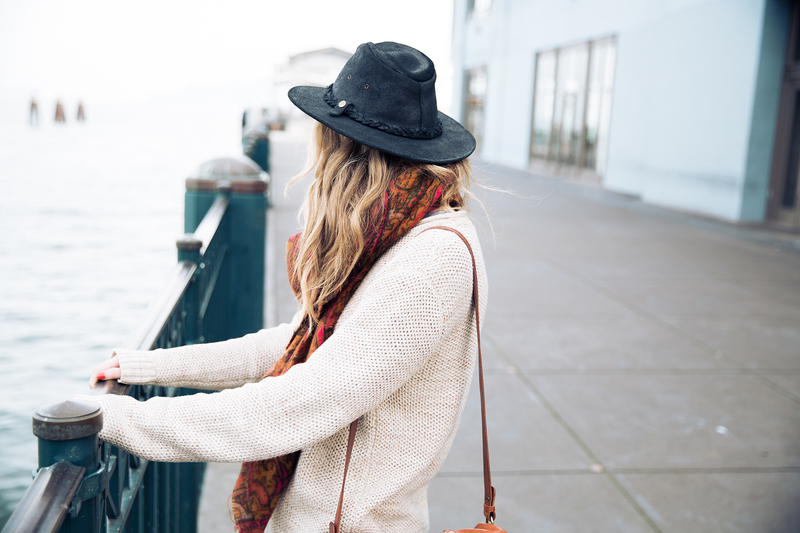 To winterize my outfit (for a California winter, mind you), I decided to add a scarf with rich tones and texture as well as a leather hat. 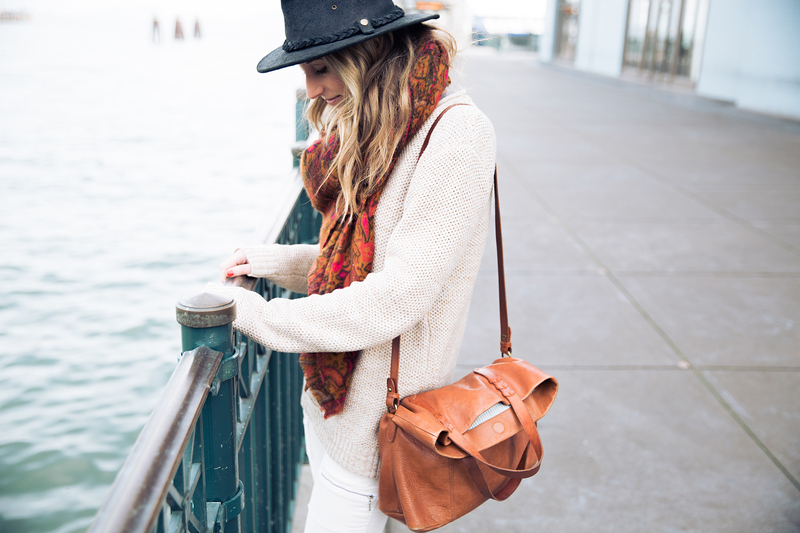 To bring out those warm tones in the scarf, I went with a brown leather bag and suede booties. So, What Do You Want to Do With Your Life? I love that sweater! And I love that you bought it from the men’s section – that’s where I buy most of my cozy knit sweaters! It’s on sale right now so it looks like it will be apart of my wardrobe very soon :) Thanks for sharing! Yesss! It’s SO affordable too!! I LOVE shopping in the men’s section! I find that their pieces tend to be cozier and looser, without being too wide. 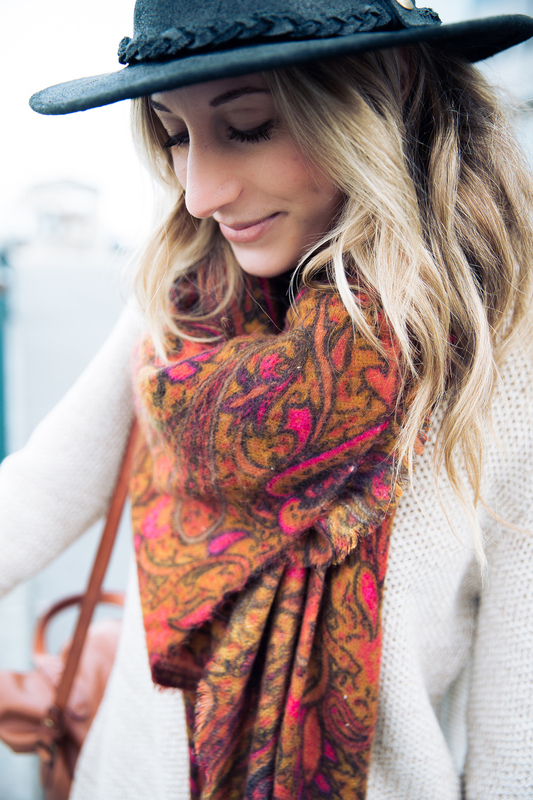 I love this gorgeous scarf and this sweater! Love your scarf. Love the brown bag but it doesn’t seem like it’s the zip transport one. Is it from Madewell? Hi Meg! Yes, it’s an older version of the zip transport that is no longer available. I’ve been looking some new outfit ideas and also ways to amp up my look a little bit. I love the idea of adding accessories to make it complete. My go to pieces are scares and a little jewelry. I’m gonna try hats, as well. Do something a little different. Thanks for the ideas! Nice outfit. Looking beautiful. I like your outfit.